Valve has joined with GameStop, GAME UK, and EB Games to bring dedicated "Steam Sections" to their stores in the US, UK, and Canada later this fall. 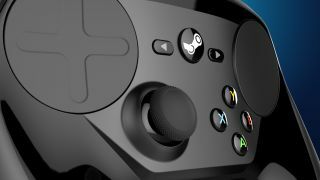 The new sections will feature Steam Hardware devices, including the Controller, Link, and a number of Steam Machines, as well as Steam prepaid cards in various denominations. "GameStop, GAME UK, and EB Games are leading retail destinations for core gamers and early adopters," Valve Supremo Gabe Newell said in a statement. "Creating a 'store within a store' across North America and the UK is a significant win for getting the first generation of Steam Hardware products into gamers' hands." "Steam has helped grow PC gaming into a leading platform for games," GameStop SVP of Merchandising Bob Puzon added. "With millions of gamers already enjoying the Steam desktop experience, we anticipate a strong demand for the upcoming Steam Hardware products and are looking forward to serving as the exclusive non-digital retail launch partner." That last reminder about GameStop being Valve's "exclusive" partner in this venture (in the US) is very much marketing-speak, but still worth quoting because it's true. The PC has re-emerged as an important, perhaps even dominant, gaming platform largely through the strength of the digital marketplace, which is of course anathema to brick-and-mortar retailers: GAME underwent a painful contraction a few years back, and I gave up on EB Games ages ago because it no longer offers anything to attract the PC crowd. If they, and GameStop, can successfully incorporate the Steam brand into their operations, then they might not be quite as inevitably doomed as they previously appeared. Steam Hardware is currently "targeted for release" on November 10.